If you’re a mystery or suspense fan and have never heard of Cornell Woolrich, let me introduce you to one of the most prolific, stylistic and ingenious writers of the noir era. His life was in some sense a tortured one containing successes and failures and dominated by his overbearing, wealthy mother. Perhaps best known for his short story, Rear Window, which became an Alfred Hitchcock movie, Woolrich wrote more than 25 novels, numerous screen plays and dozens of short story collections. According to IMDB.com Woolrich novels and short stories were used as the basis for more than 125 movies and TV dramas. Woolrich died in 1968; few people attended his funeral. Born in New York City in 1903, he struggled throughout the late 1920s and early 1930s writing short stories and (uncredited) screenplays for feature films in Hollywood. While in California he married a producer’s daughter, but the marriage was short-lived and Woolrich returned to New York and his mother. During the 1930s he wrote three novels and many short stories which appeared in pulp mystery magazines. Gradually through his inventive plots and swift pacing he gained recognition and soon started cranking out superb noir suspense novels, many of which–if not all–became movies or TV dramas. The 1940s novels earned Woolrich a substantial living and a reputation on par with the best at work in noir. This is one Woolrich collection that’s available, not the one mentioned in this article. The Woolrich novels are compelling but so are his short stories–his short crime tales from the 1930s are an excellent introduction to this author. Originally this article was going to be a review of the “Rear Window” collection, but not only is it out of print, it seems to have disappeared. In fact, many of Woolrich’s books are becoming rare. Amazon and ebay prices for many used novels and story collections can reach more than $100 although many are available (used) in the $10 to $50 range. 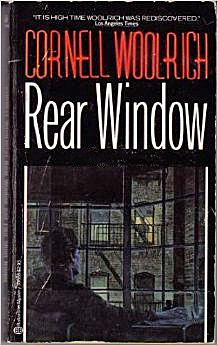 There are other Woolrich collections called “Rear Window” available online but no listings I found provide the names of the stories included. Thus, let me introduce you to a few of the master’s tales that you may find in more than one collection. Woolrich stories often find average citizens stuck in impossible situations. Such is the case in I Won’t Take a Minute (1940). Protagonist Kenny is walking his fiancé home from work one evening and she has to stop at an apartment building to drop off a package that her boss asked her to deliver. Kenny waits outside and she goes up in the elevator after telling him she won’t take more than a minute. Of course she never returns, and the balance of the story is Kenny’s attempt to find her. The Corpse Next Door (1937) is reminiscent of Poe’s Telltale Heart but Woolrich’s tormented main character is obsessed by the contents of a Murphy bed. In, You’ll Never See Me Again (1939) , Ed Bliss has an argument with his wife who storms out supposedly heading for her mother’s house. After two days Bliss is told that “Smiles” never made it to her mother’s and he runs afoul of the police in a frantic attempt to find his wife. The 41-page story is filled with nighttime car chases, resourceful amateur sleuthing and repeated searches through a sinister house in the country. In Dead on Her Feet (1935), rookie detective Smith is sent to investigate a nine-day old dance marathon and locate one Toodles McGuire, a 16-year-old whose mother has called police. Detective Smitty, who flips over his jacket lapel to flash his badge, locates the missing girl but then finds himself investigating a murder. His method of solving the case is macabre but effective. Loved the post! Good job Mr. Bacon. Loved learning about Woolrich & saddened by his state of mind.